A staff member at the 2019 Montreal International Auto Show looks on. The 76th annual Salon International de l'Auto de Montréal is on for a few more days at Palais des Congres in the old part of the city. For 2019, the show featured two North American and 33 Canadian vehicle debuts. Let’s take a closer look at some of them below. 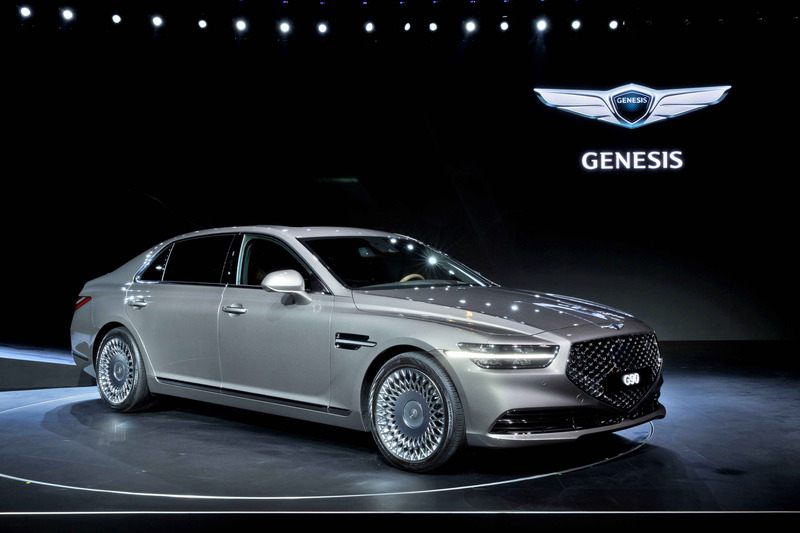 Genesis unveiled the redesigned G90 on our shores for the first time at the Montreal Auto Show. The 2020 flagship is significantly different than the outgoing model wearing a much larger, pentagon “Crest” grille containing alloy mesh rather than horizontal slats. The quad-headlamp housings appear flatter, a trend that will be seen across all future products. Another striking visual element are the standard 19-inch dish-type wheels reminiscent of 90s Euro style. The cabin is all about upscale comfort. The driver’s seat is heated, ventilated, utilizes power bolsters and is 22-way adjustable (front passenger is 16-way). Infotainment is controlled via a 12.3-inch touch display with built-in Apple Carplay and Android Auto connectivity. Customers can choose between two engines: a 3.3-litre twin-turbocharged V6 making 365 horsepower, and a 420-horsepower 5.0-litre V8. An eight-speed automatic transmission and all-wheel drive is equipped on all grades. 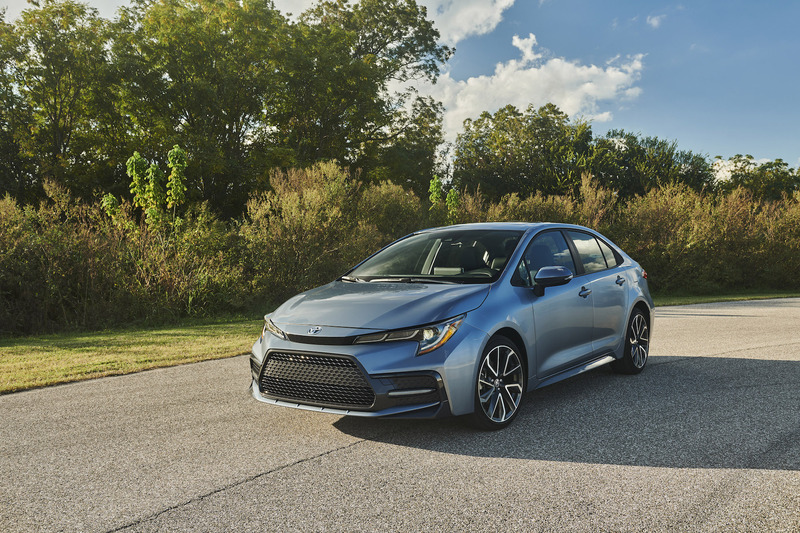 Last year, Toyota made a splash introducing the gorgeous 12-generation Corolla hatchback — now, it’s the sedan’s turn. The car has similar axe-shaped headlights that blend seamlessly into one another, and may be outfitted with an adaptive LED lighting system that moves into the direction of a turn. An option that is surprising, but welcome, on an offering in the entry-level segment. Base trims get the familiar 1.8-litre motor, while XSE and SE receive a 2.0-litre delivering 169 horsepower. Both are mated to a continuously variable transmission. 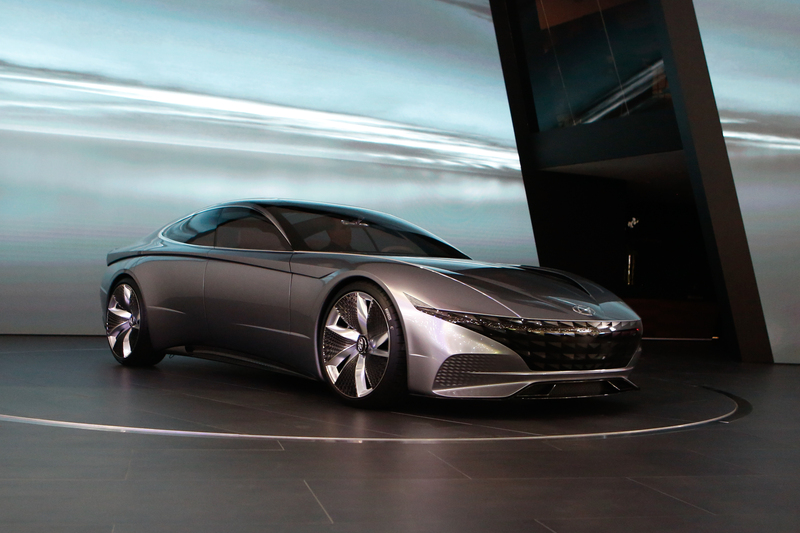 What’s an auto show without a cool concept car? The Le Fil Rouge is a car that actually looks backward in order to go forward, drawing inspiration from Hyundai’s own Delorean-esque 1974 Coupe Concept. The sporty long-wheelbase four-door has a distinct look due to the front and rear pillars, as well as the roof, all being flowing together. Inside, technology meets nature where many of the surfaces are made using re-vitalized wood and next-generation fabrics. The interior is anchored by a floating panoramic display mounted in front of the driver.